What makes our Prague trip unique? Prague is a music-lover’s dream, where the sounds of Mozart come drifting from every corner of the city. It’s also a living, breathing fairy tale with its cobbled streets, Gothic spires, fanciful façades, and a magnificent hilltop castle presiding over it all. 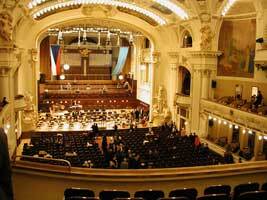 The Prague Spring Festival is one of the most illustrious of European music festivals. 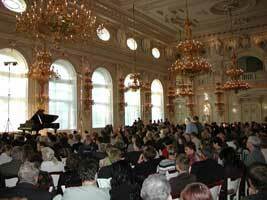 In supremely beautiful settings, from lavish castle ballrooms to verdant royal gardens, it stages a range of international as well as Czech performers. In addition to enjoying concerts in private halls that are open only for special performances, you will get to know this magical city through personalized walking tours, including a focus on Prague’s musical heritage. Our accommodation for the week is an elegant and historic recently restored hotel in Old Town – within easy walking distance to the events of the week. Prague’s markets and shops offer a marvelous taste of real life in this charming city, and we’ll explore them together, discovering the best of Prague’s famous Bohemian crystal, jewelry set with garnets-deep red as the darkest wine, colorful marionettes, or perhaps a souvenir from a previous century in a favorite antique shop. You’ll be pleasantly surprised at the quality of Prague’s cuisine! From fusion and world creations to classic Bohemian fare, dining in Prague is a delicious adventure. We include alfresco meals on a garden- terraced hillside, elegant repasts in a renovated baroque palace, and a cosmopolitan feast beside the river, while leaving some free mealtimes for you to discover a favorite or two of your own. We can’t wait to wander the city once again, taking in the sights that Mozart saw centuries ago, walking along the river that inspired Smetana, Prague’s favorite composer son, and strolling the romantic Charles Bridge in the morning quiet. I have recommended you to several of our friends and will keep you in mind for our future travels. We have traveled a fair amount and your Spring Music Festival tour in Prague stands out as one of the most memorable. Your attention to detail for carefully selected restaurants with ambiance and excellent food, outstanding music in beautiful historical venues where the presence of earlier musicians was recognized, and walking tours that brought the history of Prague alive, reflected your personal care and accommodation. Although we made our own travel plans in the past and were hesitant to join a tour, we would consider Music and Markets first for future traveling.